Width upto 63” made from 100% Cotton, 100% Viscose, 100% Polyester, Blended, Lycra as Pure White, Reactive or Vat Dyed, Pigment, Reactive, Prints, Disperse or Dischange print with finishes as required by our Customer. Pure White, Reactive or Vat Dyed Cotton, Rayon, Polyester or Blended yarn. We started our yarn dyeing plant during the year 2004. 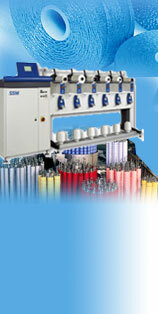 We have imported fully automatic, sophisticated yarn dyeing machines in order to avoid batch variations. All processes are controlled by computer. The imported radio frequency yarn dryer drys the yarn with even heating and keep the moisture away. The updated rewinding and meter winding machines having the splicing attachment with negative device will keep the yarn in even length on all cones. In a very short time we have been able to create a nich in the market and our esteemed customers list is very long but to list some of them who are well known in the industry are CHOUDHARY GARMENTS, SONAL GARMENTS, RENFRO INDIA PVT. LTD., HYTONE, TEXPORT GARMENTS, RAPIER MACHINE MANUFACTURER, GINI SILK MILLS, MUDRA SYNTHETICS etc.